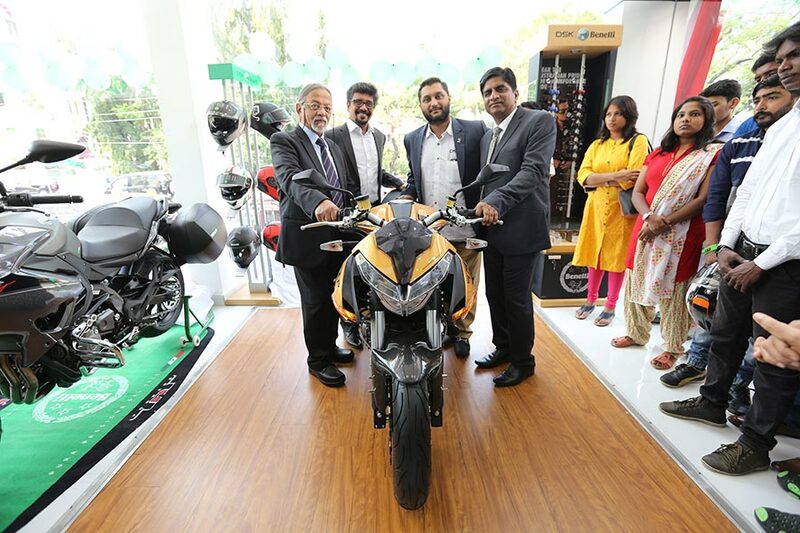 After witnessing an exceptional response in Chennai, DSK Motowheels, one of India’s most well-established and strongest players in the superbike industry announces the launch of its second showroom for the legendary Italian superbiking brand Benelli in the city. The state-of-the-art showroom is situated in a plush locale at V – Block, 5TH Avenue, Old No. 86 / New No. 74, Anna Nagar; showcasing the entire range of DSK Benelli superbikes available in India. Booking and deliveries are now open at the showroom. The new outlet along with the existing showroom in Chennai is also under the dealership of ‘Power Super Bikes’ located at Anna Salai, near Gemini Flyover. The second showroom also houses the sporty-looking Tornado Naked Tre, or TNT superbikes that encompass the TNT 25 – Single Cylinder 250cc engine, TNT 300 – In-line two-cylinder 300cc engine, TNT 600i – In-line four-cylinder 600cc engine, TNT 600 GT – In-line four-cylinder 600cc engine, TNT 899 – In-line, three-cylinder 898cc engine and TNT R – In-line, three-cylinder 1131cc engine. DSK Benelli has received an overwhelming response in the city of Chennai for its best-in-breed superbikes. Backed by this demand, it gives us immense pleasure to launch our second showroom for superbiking aficionados in Chennai in association with ‘Power Super Bikes’. The philosophy with which we operate is in tandem with the ethos of our Chennai dealer. The employees at DSK Benelli – Anna Nagar have been provided with specialised training in management of sales, service, spare parts and customer service, to ensure that customers can enjoy the best-in-class ownership experience that our brand stands for. Keeping in mind the global standards, we are also glad to announce that all the DSK Benelli showrooms across India including the new DSK Benelli showroom in Chennai, meet the International CI standards of Benelli global showrooms. Our main focus is to align DSK Benelli’s presence across all strategic locations in order to generate strong brand eminence. Chennai is one of those key markets where we have already established a robust foothold. The second dealership will not only act as a platform to sell more motorcycles but also as a place for DSK Benelli superbike enthusiasts to interact with other bikers and share their love for the Italian biking legend. TNT 25 – Rs. 1,83,000. TNT 300 – Rs. 3,08,000. TNT 600i (ABS) – Rs. 5,83,000. What is your take on DSK Benelli Motorcycles?